Fantasy Faire is Second Life’s largest gathering of fantasy designers, enthusiasts & performers. 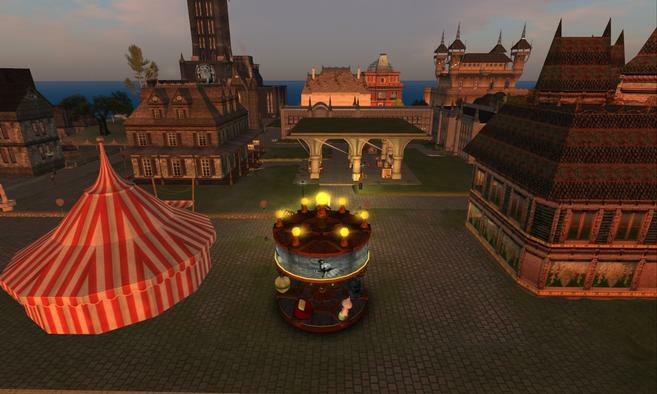 It’s two weeks of commerce, special events, music & fundraising in fifteen SIMs created specifically for this event. Proceeds go to the American Cancer Society’s “Relay for Life” fundraising effort. Last year’s Fantasy Faire raised more than US$30,000! This is the NeoVictoria Project’s fourth year sponsoring a region. We’re thrilled to be reunited with Beq Janus on their fantastical steampunk circus region named “Anansi“. And we have an exciting roleplay story cycle planned; our schedule is below. Come and see the NeoVictoria Roleplay Group in action; we welcome you to join in the fun! Only the first scene is set in NeoVictoria SIM; the rest are in the Anansi SIM in the Fairelands. We will be shooting machinima, so please wear your low-arc, low-script finest. A portal is opened to the fairelands by Cerridwen, the Sidhe of the Cathedral. The NeoLondoners make their way to the circus realm of Anansi. On the circus faireland of Anansi, the high-wire is being raised as its troupe of performers prepare their acts. The company is all a-buzz with the news a promoter will be in the audience, scouting for fresh talent. Estrella Arian, Queen of the Trapeze, plummeted to her death in what the authorities are describing as MURDER! Her rival on the highwire has been jailed. Will Doctor Seito Akai, an Adept in the Anubi caste of the Imaja Order, be able to divine the truth? The roleplay may be over, but the fun continues! To celebrate the successful conclusion of our Dark Circus story cycle, please join the NeoVictoria Roleplay Group for an evening of steampunk, circus and dark cabaret tunes, spun live on Fantasy Faire Radio! Gabrielle Riel of Radio Riel fame is our DJ for the party; she will start broadcasting at 6 pm, SL-time. The party will not be “in-character”, so come as you are! FantasyFaire2016 ended last Sunday: it raised almost eight million Lindens (that’s more than US$30,000) for Relay-For-Life and the fight against cancer. This amazing number only happened because people cared enough to volunteer hundreds of hours of time to create content which drew players from all of Second Life. This year, NeoVictoria sponsored the Serenity SIM and produced a new roleplay cycle. We’re taking a moment to publicly thank the people in our community who worked so hard to make “The Sidhe and the Soul-Eater” such a spectacular success! JulianEastman brought a sense of whimsy to Sir Karl Twinewood, the Sidhe Automaton, which made the loss of that character even more heartbreaking. LurkingNightTerror took the idea of the mythological dullagan to make their Crom Dubh a formidable soul-caster within the confines of our storyworld. It is always wonderful to watch people build the lore! Hmmmph Stenvaag created a special edition of the NeoLondon Times, so we had an in-character prop to give to faire-goers during our time in Serenity. If you haven’t read it, here’s the link. Jhaesoph Foxdale made the shadow-imp avatar; these were great roleplay foils and one of our Relay-for-Life gifts, so any of the fairegoers could join the fun! 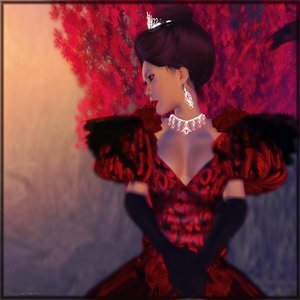 Tarquin Evermore crafted a beautiful mesh & prim fantasy skirt, fit for a steampunk queen, as one our Relay-for-Life gift. 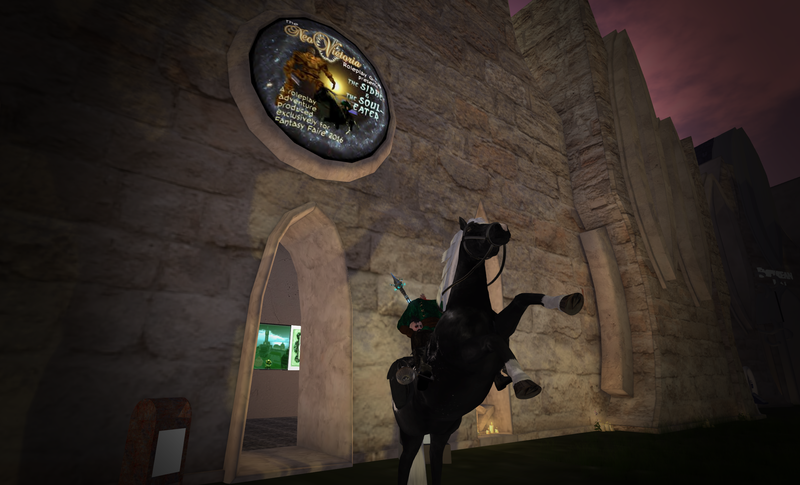 Fianah Mistwood created spectacular “mirrors” for each of the races in our storyworld; they were the highlight of the information section in our build in Serenity! Xiuhcohtl Balazic as Anya “Ginger” Greer. Congratulations everyone for a job well done; you are some of the most generous people I have known; you make The NeoVictoria Project one of the best roleplay environment in Second Life! Here is a parting gift from Fantasy Faire 2016, courtesy of the amazing Gabrielle Riel, who was kind to DJ a great party for us in FF Serenity SIM last Thursday. She uploaded the party play-list to her MixCloud page, so for some steampunk and dark cabaret goodness, please follow the link below and enjoy! NeoVictoria – The Concluding Celebration for The Sidhe and the Soul-Eater by Gabrielle Riel on Mixcloud. The agent of chaos causes more trouble, but Crom Dubh and the Sidhe automaton are able to rally the City to fight the Soul-Eater. It frees itself, but they are able to briefly trap it, then open a rift to the gate called Yog-Sothoth and send it to the madness of the terrible realm of Cthulhu. Players: Belial Darwinian as Belial (an agent of Chaos); Asil Karu as Healer Asil Karu; AlyssTheMenace Resident as Prelate Leonora Blackmore; JulianEastman as Sir Karl Twinewood (the Sidhe automaton); LurkingNightTerror Resident as Crom Dubh; thefireoflife Resident as the Soul-Eater; Xiuhcohtl Balazic as Anya ‘Ginger’ Greer; Tarquin Evermore as the shadow-imp Stinky and Samuel Bellamy; peacelynxtree Resident as the shadow-imp Shadow Cat; abigalekirin Resident as Kotter Keen; MadMechaMessiah Resident as Rampart Haskell Faustus; ValentineAdler Resident as Valentine ‘Val’ Adler and SteampunkGreis Resident as Greis Ironhart. This roleplay is the fourth a in series being produced by the NeoVictoria Roleplay Group for Fantary Faire and the fight against cancer. Read more about it at our page on the FF2016 site; here’s the link. Crom Dubh, the Sidhe automaton and the NeoLondoners are attacked by shadow-imps: minions of the soul-eater. And a strange magician, a self-described agent of chaos, attacks the soul-well. They use magic and science to subdue these threats, and begin to understand what they portend: the Soul-Eater’s true escape from its binding well and the destruction of the city. A plan is formed on how they might dispatch the threat forever! Players: Belial Darwinian as Belial (an agent of Chaos); Asil Karu as Healer Asil Karu; AlyssTheMenace Resident as Prelate Leonora Blackmore; JulianEastman as Sir Karl Twinewood (the Sidhe automaton); LurkingNightTerror Resident as Crom Dubh; thefireoflife Resident as the Soul-Eater; Tarquin Evermore as the shadow-imp Stimpy the Imp and Samuel Bellamy; peacelynxtree Resident as the shadow-imp Shadow Cat; and Hmmmph Stenvaag as the shadow-imp Stumpy. This roleplay is the third in series being produced by the NeoVictoria Roleplay Group for Fantary Faire and the fight against cancer. Read more about it at our page on the FF2016 site; here’s the link. Crom Dubh and the NeoLondoners finds the Sidhe automaton, but also discover that small evils, minions of the soul-eater, have begun to infiltrate the city. Players: Asil Karu as Healer Asil Karu; AlyssTheMenace Resident as Prelate Leonora Blackmore; JulianEastman as Sir Karl Twinewood (the Sidhe automaton); LurkingNightTerror Resident as Crom Dubh; Marchioness Resident as Marchioness Honoria Wallingford; ValentineAdler Resident as Valentine ‘Val’ Adler; thefireoflife Resident as the Soul-Eater; Tarquin Evermore as Samuel Bellamy; and Xiuhcohtl Balazic as Anya “Ginger Greer. This roleplay is the second in a series being produced by the NeoVictoria Roleplay Group for Fantary Faire and the fight against cancer. Read more about it, and see all the machinimas, at our page on the FF2016 site; here’s the link. In addition to sponsoring the cost of the SIM, members of our community also made some very special items just for the Faire! Purchase them at the Relay-for-Life vendors on the second level in our build on Serenity. Come join in the chaos in Serenity! Comes with optional built-in, bump-driven health meter. The scene begins in NeoVictoria as a soul-caster, the dullahan named Crom Dubh, arrives on planet NeoVictoria. With the help of the powers of the Cathedral of Air & Darkness, they open a portal to the Fairelands and the City of Serenity. This roleplay is the first in series being produced by the NeoVictoria Roleplay Group for Fantary Faire and the fight against cancer. Read more about it at our page on the FF2016 site; here’s the link.